According to Indian legend, the Bodhisattva Avalokiteśvara was born (bearing a lotus flower) from a ray of light that sprang from Amitabha Buddha’s right eye. Immediately upon birth, Avalokiteśvara uttered the six sacred syllables OM MANI PADME HUM. In Buddhist tradition, the mantra is used to invoke his compassionate intercession or that of his feminine counterpart, Kuan Yin (China and Japan). 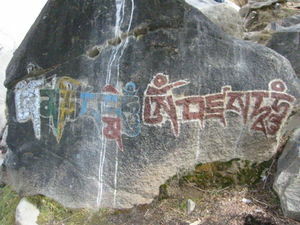 Throughout Tibet and Ladakh, Buddhists have inscribed OM MANI PADME HUM on flat prayer stones called “mani-stones” as votive offerings in praise of Avalokitesvara. Thousands of these stones have been used to build mani-walls that line the roads entering villages and monasteries. Give the simple mantra Om Mani Padme Hum. This wondrous mantra, also known of Kuan Yin, celebrates your soul, your spirit, your Atman, as the jewel in the heart of the lotus, the chakra of the heart. When someone is afflicted by disease or an evil influence, compared to any mundane ritual of healing or of repelling obstacles, the merit of the Six Syllables is much more effective for warding off obstacles or disease. Compared to any medical treatment or cure, the Six Syllables are the strongest remedy against sickness and evil. The virtues of the Six Syllables are immeasurable and cannot be fully described even by the buddhas of the three times. Why is that? It is because this mantra is the quintessence of the mind of the noble bodhisattva Avalokiteshvara, who continuously looks upon the six classes of sentient beings with compassion. Thus, recitation of this mantra liberates all beings from samsara. Take the Great Compassionate One as your yidam. Recite the Six Syllables as the essence mantra. So supplicate him with faith and devotion. And be free from doubt and hesitation. Upon hearing Master Padma’s word, the king of Tibet and the close disciples were all overjoyed and paid homage to the master, prostrating themselves to the ground. Pearls of Wisdom, vol. 27, no. 27, June 1, 1984. Pearls of Wisdom, vol. 26, no. 21, May 22, 1983. Elizabeth Clare Prophet, August 23, 1994. ↑ Amaryllis, “The Mystery of the Cosmic Circle of Life,” Pearls of Wisdom, vol. 12, no. 19, May 11, 1969. ↑ Gautama Buddha, “You Must Rise!” Pearls of Wisdom, vol. 35, no. 41, October 7, 1992. ↑ Your personal guide to enlightenment. ↑ Yeshe Tsogyal, The Lotus-Born: The Life Story of Padmasambhava, trans. Erik Pema Kunsang (Kathmandu, Nepal: Rangjung Yeshe Publications, 1998), pp. 195, 196–97. This page was last modified on 13 March 2017, at 18:22.